My husband and I were in the theater several weeks ago, watching the previews and waiting for Puss In Boots to go on when the trailer for a movie called Hugo came on. It piqued our interest because it is a film by Martin Scorsese, one of my husband's favorite movie directors. And then, for some reason, I recalled seeing (or hearing) about a book with the name Hugo in the title, and thought maybe the movie was the adaptation of the book. 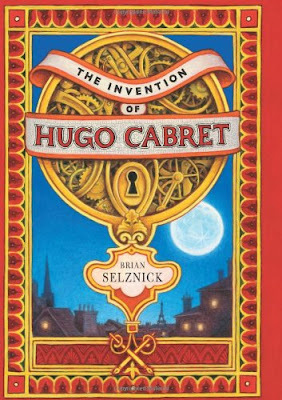 Turns out I was right on that one: Hugo the movie is based upon the novel The Invention of Hugo Cabret by Brian Selznick. Thankfully, at the same time that I was looking for a print copy and even had one reserved for me at FullyBooked, my bookish friend Aldrin was about to go on a book-selling rampage, raking money off his print books in exchange for a nifty iPad. :D Without batting an eyelash, I purchased his copy of The Invention of Hugo Cabret and began devouring it in no time. The Invention of Hugo Cabret is the story of Hugo, a 12-year-old orphan who lives in an apartment within the walls of a busy train station in Paris. He lived there with his Uncle Claude, the Timekeeper of the station whose job was to maintain and fix the various clocks therein, until the latter vanished one day, never to return. During this time, Hugo was obsessed with the repair of a mechanical man, his father's project prior to his death. In order to fix it, Hugo needed tools, parts and cogs, which he procured by stealing wind-up toys from a toy booth inside the train station. The toy booth was owned by an old man whose true identity will later be discovered and, together with his niece, Isabelle, will figure in Hugo's life in a huge way. More than half of the story was told through illustrations, and a small part was devoted to text. The highlights of the book were expressed through the drawings, which I found very artfully and beautifully depicted. I loved the drawings! They were in black and white, like charcoal drawings, and drew very close attention to details, you could see how meticulously they were done. How I wish I had the talent for the arts like that. 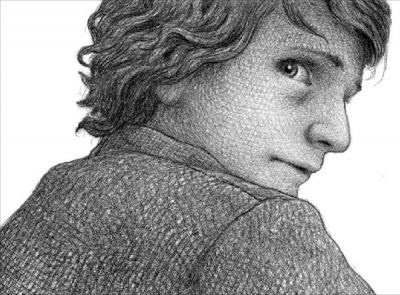 Brian Selznick's talent is just amazing. And, unlike a graphic novel which I've always found very difficult to follow, this book had me wishing for more illustrations between the pages. The story itself was lifted from not-so-recent history: it's about an early 20th-century filmmaker George Melies, his old films, and his collection of mechanical figures called automata. Much of the storyline was adopted from true events in Melies' life; it's like Selznick incorporated Melies' biography into the fictional setting of the book. Being a fan of historical fiction, this aspect of the book did not escape my attention and even upped the value of the story, in my humble opinion. I just finished reading this last night to my 6 year old after almost 2 weeks of reading a chapter or 2 a night. He loved it! I can't wait for the film, it looks fabulous!